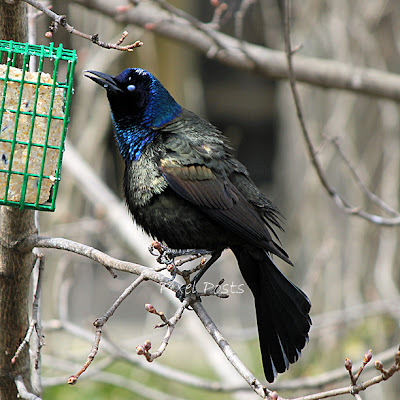 Common Grackles make a variety of squeaks, whistles, and croaks. The typical song, made by both males and females, is a guttural readle-eak accompanied by high-pitched, clear whistles. It lasts just less than a second and is often described as sounding like a rusty gate. I swear I can almost hear it! Beautiful colors in your pictures -- I tend to overlook these birds; I'll take a closer look next time. I was just going to write the same thing as Sallie!! I can indeed almost hear him!! Terrific captures for the day, Karen!! Hope your week is off to a great start!!! Now that is clever!!! !And such a beautiful blue. You have shown the beauty of a bird we often overlook! Gorgeous pictures ! what a beautiful bird ! Some people would give their right arm for such detailed pictures. What a gorgeous bird. Thanks for playing Blue Monday. i like the ruffled plumage!! great shot karen, happy monday!! That's an awesome shot of the birdy, wow!!! We have those around here. They are cold black and make so much noise. I do not like them.They try to attack the other birds. What a dazzling bird and divine photography ~ Wow! These birds are so colorful and fun to photograph! You captured their bold behavior quite well. Beautiful, sharp shots, Karen! Great photo series and perfect captions. What a great shot! I'm here from Blue Monday. I love birds and this one is very lovely. Looks like the head is glittery because of the deep blue color! Perfect post! Have a terrific week! 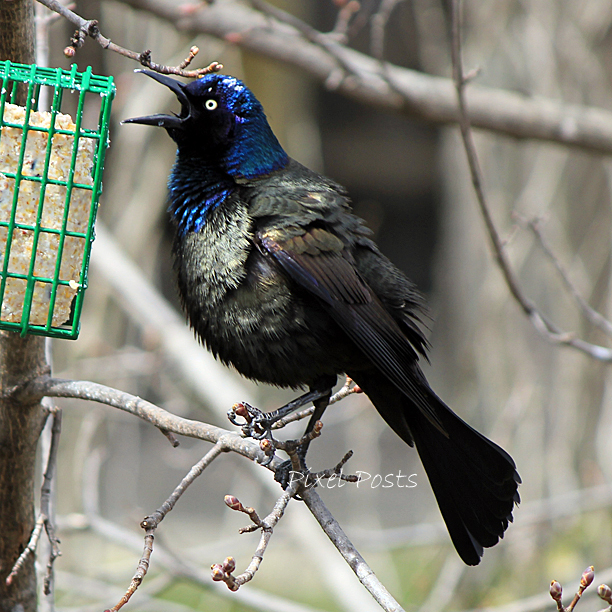 The plumage on the Grackle's (wonderful name) head is incredibly vivid. Gorgeous. Wonderful shot - the metallic colours are splendid. Pretty shots of the Grackle. They are colorful birds. Outlaws they may be, but in the sun they`re beautiful. Boom & Gary of the Vermilon River, Canada. Wow! You have taken the shots so well. Fantastic series of shots. I love that wide open mouth at the end. What a wonderful series, said with a squawk! So cute bird! lovely to see! Wonderful feather detail captured on the colorful squawker! Awesome shots! They made me smile. You certaionly caught the action there Karen. Good shots that made me smile too. Such a beautiful bird. Love all the photos. The irridescent blue is amazing! And love the stages of winding up for the squawk! Great photos! What striking color and contrasts you've been able to capture. Extraordinary. Great shots and you have captured the iridescence of the plumage so well. Nice shots of the Grackle! You captured the grackle's shine very well here! You've made me appreciate the beauty of grackles. I wouldn't have thought it possible. (When my son was very young, he called them "greedybirds" for their behaviour at the feeder. Gorgeous photos, so sharp and with so much action and color. Love that bird in the photo. Classy color. You hit it right in the lens. such a lovely series of grackle photos...Thanks so much for visiting my blog and leaving a comments. cheers. Wonder what he is saying? Maybe it is unhappy with the breakfast selection! Those are excellent, I especially like the last one. 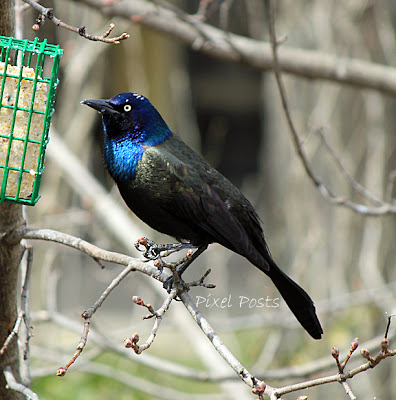 Excellent photos, Grackles are such beautiful birds!